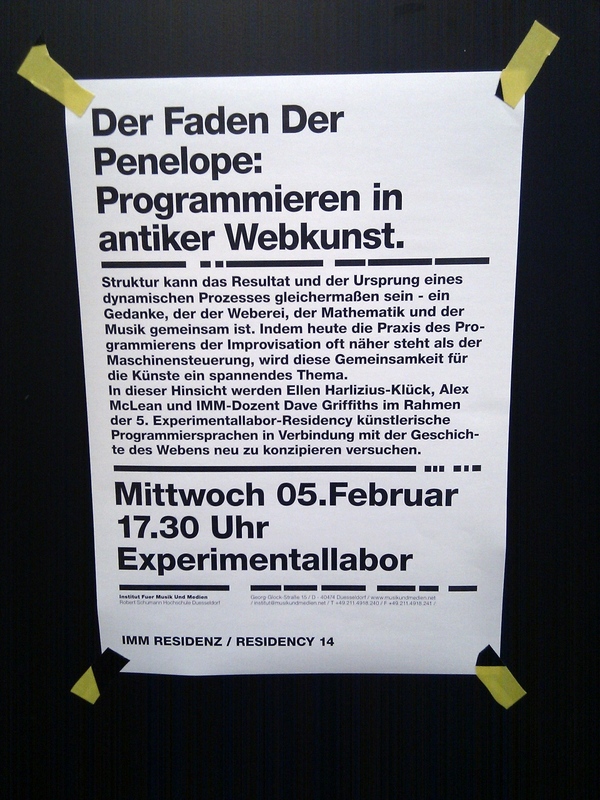 My second day of teaching was followed by a presentation by Ellen Harlizius-Klück and Alex McLean on weaving, ancient mathematics, programming, mythology and music – which provided a great introduction for a meeting we had the next day on an upcoming project bringing these concepts together. Part of the ‘Project Nightjar’ camouflage work I’m doing for the Sensory Ecology group at Exeter University is to design citizen science games we can build to do some research. 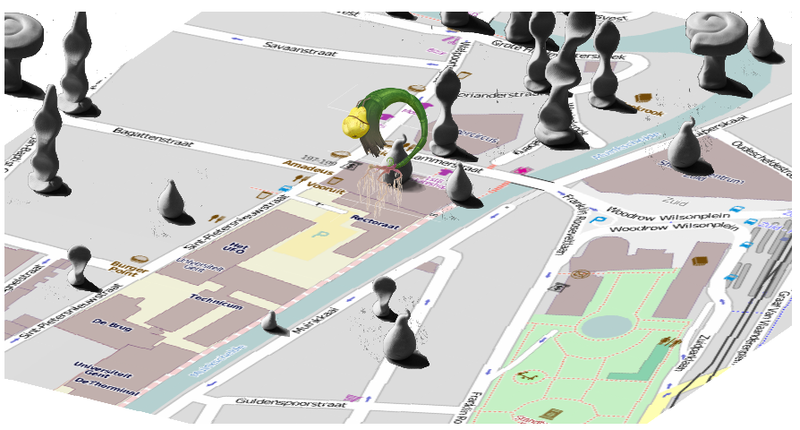 One plan is to create lots of patterns in the browser that we can run perceptual models on for different predator animals, and use an online game to compare them with human perception. A nice aspect of this is that it’s easy to artistically control the patterns by changing the starting images, for example much more naturalistic patterns would result from noisier, less geometric base images and more earthy colours. This way we can have different ‘themes’ for levels in a game, for example. 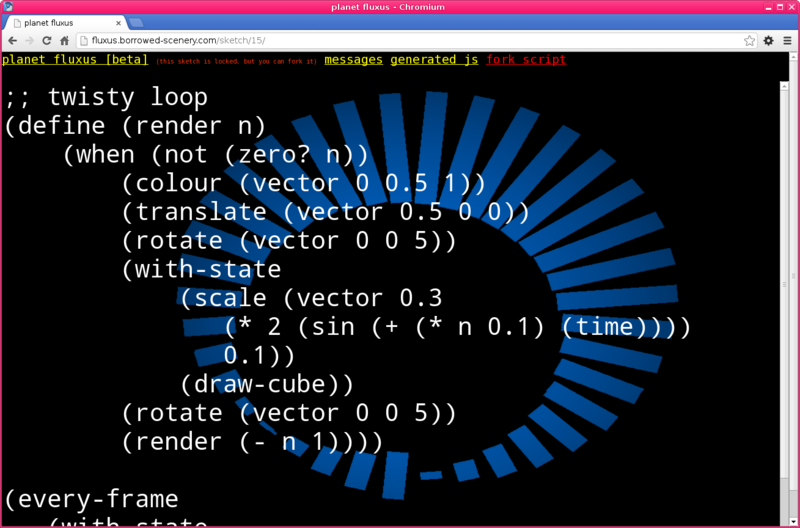 Ops are the blend mode operations, and terminals are images, which include translation and scale (not currently used). 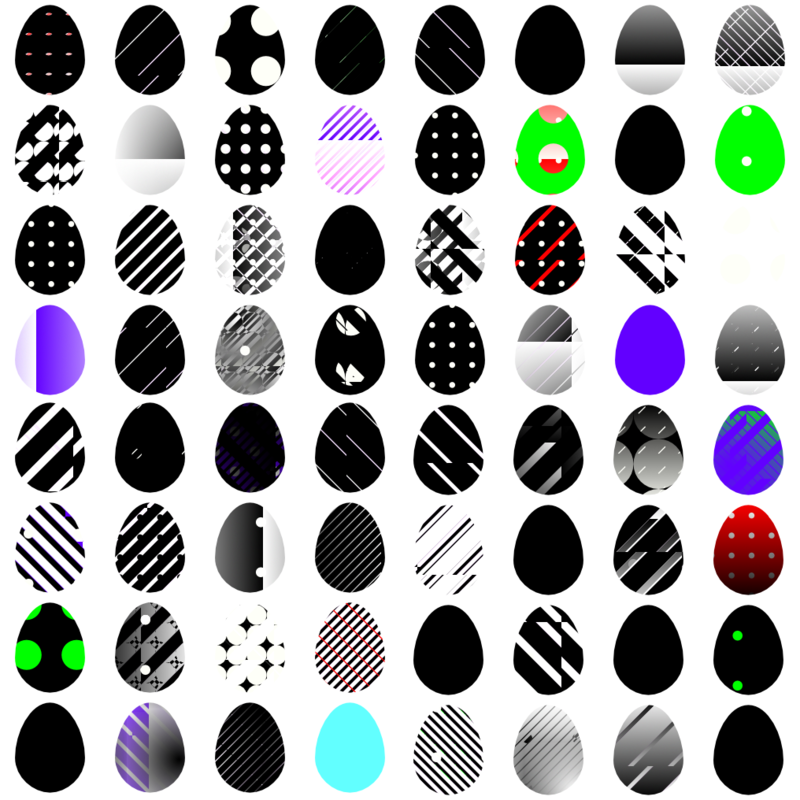 The egg trees get drawn with the function below, which shows the curious hybrid mix of HTML5 canvas and Scheme I’m using these days (and some people may find offensive :) Next up is to actually do the genetic programming part, so mutating and doing crossover on the trees. 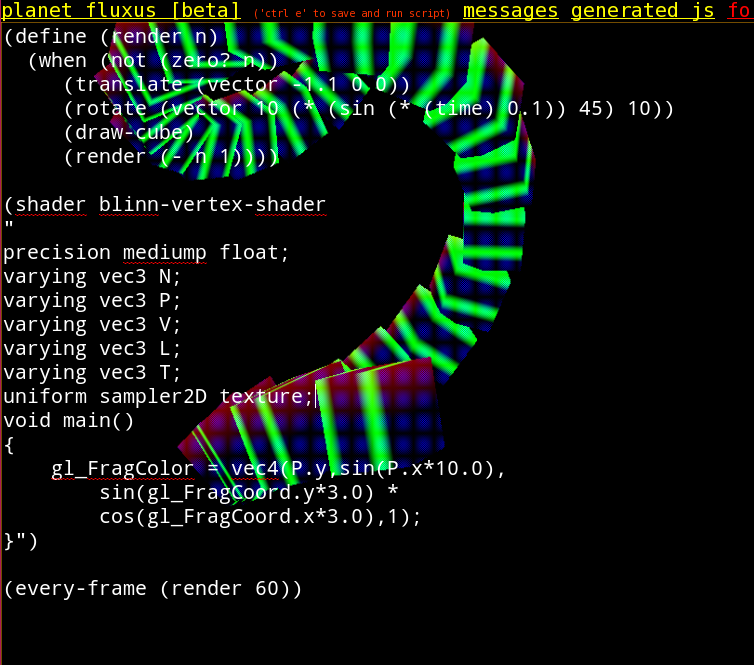 Fluxus now runs in a browser using WebGL. 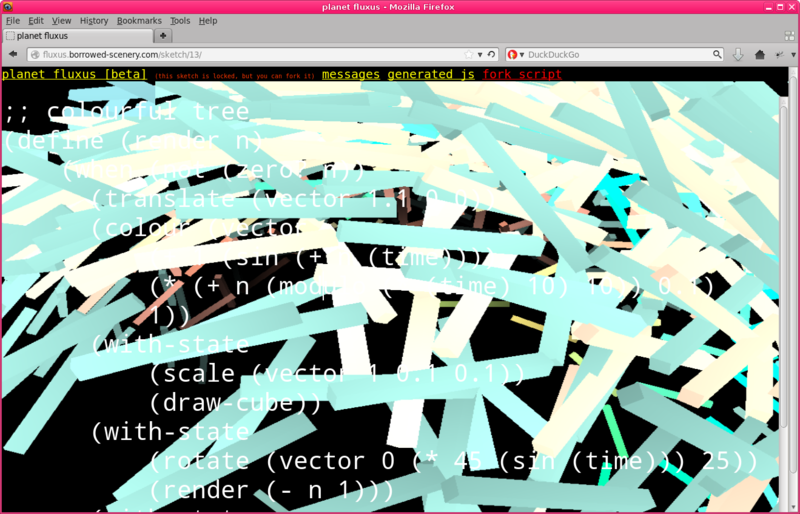 Not much is working yet – (draw-cube), basic transforms, colours and textures. I’ve also built a small site in django so people can share (or perhaps more likely, corrupt) each other’s scripts. Also much inspired by seeing a load of great live coding at the algoraves by Davide Della Casa and Guy John using livecodelab. A bit of R&D this morning into websockets. Previous games like Naked on Pluto and Germination X have made use of standard HTTP protocol for their client server communication. This is easy to set up (as a newbie web programmer) and fine for prototyping and proof of concept – but has some serious problems with regard to scale. More seriously, the server has no real notion of who the client is and what they have received already, so all the data needs to be sent for each poll. This results in duplicate data being sent, and is a waste of bandwidth. Underlying the HTTP protocol are sockets for sending the data – each request is treated as a distinct event so a socket is created and destroyed to return the response. A better way is to hook into this lower level and use sockets directly – each client then has a unique connection on the server, and data can be sent in both directions. Also the server is told when the socket is disconnected so things can be cleaned up. This approach takes us from perhaps 100’s of simultaneous connections for an online game into more like 10,000 theoretically – so much more into the big league, but also more importantly persistent connections like this allow for some interesting game mechanics.